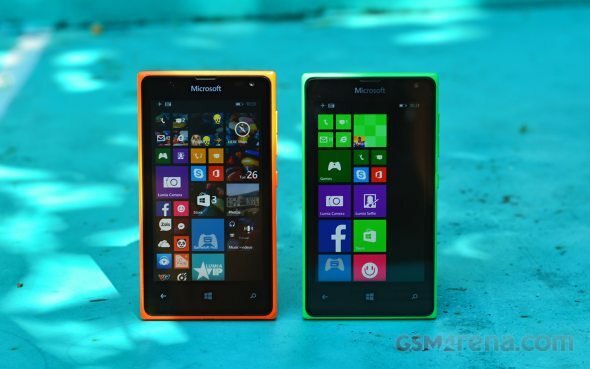 Both Lumia 435 and Lumia 532 are running the Windows Phone 8.1 (Update 1) out of box. The latest Lumia Denim software expansion package comes pre-installed, too, for some exclusive software perks. The duo lacks the Update 2 firmware, which brings organized Settings menu and app permissions, among other improvements. Glance Screen is available only the Lumia 532, which is odd as both run the same OS on the same type of display. Anyway, Glance screen shows you the time and it also supports notifications - the same as the ones you've permitted on your lockscreen. What you get is basically a monochrome representation of your lockscreen. You can opt for the Glance to be always on, timing out after predefined interval, or to light up when you pick up the phone. Other than the Glance screen, there are no software differences. The lockscreen itself looks the same as the Glance screen, but with colors. Double tap to wake and additional security are available as options. The familiar interface with resizable live tiles is your Start page, you can group tiles into folders if you like. Almost every app within the Store comes with its own tile and you can see useful info live at your homescreen. Tile background is available and while it looks great, still not all live tiles are transparent, which can detract from the overall effect. Quiet Hours mode is Windows Phone's take on the Do Not Disturb feature - it can be set to block calls and messages over pre-defined time interval, plus it can also go on automatically during events you have marked in your calendar. Naturally, exceptions are available. Microsoft's Cortana is available to recognizes your natural language commands and questions and provide voice feedback. Cortana can fully interact with your phone and carry out all kind or commands related to it. Cortana can also track various news topics, makes suggestions for cooking and dinner, plan trips, find places and even crack the occasional joke. Microsoft Lumia 435 is powered by a very basic flavor of the Snapdragon 200 chipset with a dual-core 1.2GHz Cortex-A7 processor, Adreno 302 GPU and 1GB of RAM. The Lumia 532 runs on a faster version of the chip with a quad-core 1.2GHz Cortex-A7 CPU, while keeping the same Adreno 302 GPU and 1GB of RAM. It seems the 1GB RAM is now the minimum for the Lumia lineup, even within the entry-level, as it will ease the transition towards Windows 10 later this year. Microsoft promised to update all previous WP8 Lumia phones, even those with 512MB RAM, but the latter seems to require some (unspecified for now) sacrifices. Nobody expected any records in benchmarks department, but we were still curious to see how they do. The compound AnTuTu is highly skewed towards CPU marks and since the Lumia 435 has just two CPU cores, it gets half the points its sibling achieved. 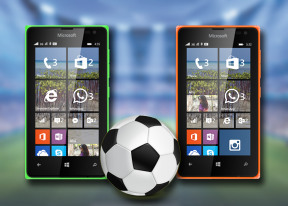 The Lumia 535 even managed to beat the way more expensive Lumia 640 here. The BaseMark OS II is another compound test, which gauges CPU, GPU, memory, system OS and web performance. The two phones outed the same scores on all departments but the processor, and thus the difference in the final rating. The entry level Lumia smartphones aren't meant to do much gaming or provide blazing-fast performance. They are designed to cover the bare minumum - calls, messaging, social networks, even navigation and office tasks, and we found they managed to do that. Windows Phone 8.1 runs fine on those, as all the crucial apps, though some heavier system apps (such as Skype) may require a few seconds to load. There are a few games that run very well if you are not too pretentious about graphics.